Hosted by Claude Brodesser-Akner, The Business looks deep inside the business of entertainment. A half-hour of thoughtful and irreverent dialogue with Hollywood's top deal-makers, filmmakers, moguls, artists and agents, The Business will clue you in on who's making pop culture pop and what's keeping Hollywood's Blackberries juicy. What's it like to negotiate during a strike. We talk with the man who led talks for employees during the acrimonious 1994 supermarket walkout. Plus, will the writers' strike be another nail in the coffin of once wildly profitable daytime soap operas.Note: This edition of The Business will not air live at its usual time slot on KCRW as it will be pre-empted by special holiday programming. It will air at 7pm. To understand the current writers' strike, you need to understand the long and contentious relationship between screenwriters and the people who write their checks. This week, Part II of our conversation with Oscar-winning scribe Marc Norman about his new book, What Happens Next: A History of American Screenwriting. Plus, while the writers strike, video games rock on--literally. 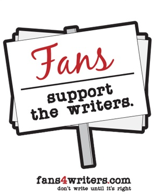 To understand the current writers' strike, you need to understand the long and contentious relationship between screenwriters and the people who write their checks. We put that relationship in the therapist's chair with Oscar-winning scribe Marc Norman, author of a fascinating new book called What Happens Next: A History of American Screenwriting. What does a producer do. We talk to two producers-turned-studio-execs about what they did then and what they do now. Plus, a chat with Hollywood's man in Washington, MPAA CEO Dan Glickman.